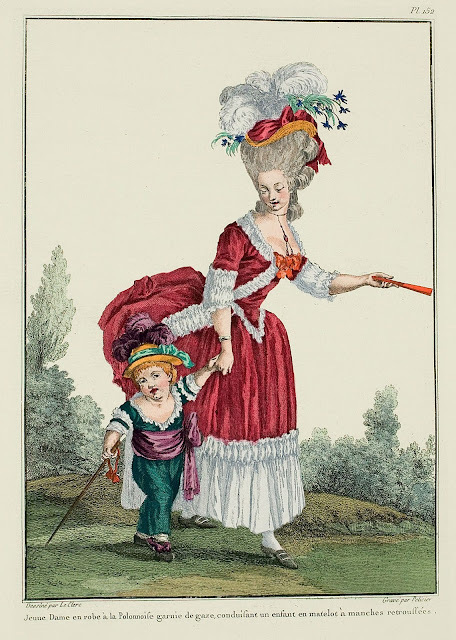 One knows that the industry of women's dress was divided between three principal groups: the staymaker, which we call corsetiers, which make equally court gowns, camisoles, children's jacquettes and fourreaux; the marchandes de mode who sew and mount caps, trim gowns with ribbons, flounces, etc. ; and finally the seamstresses. 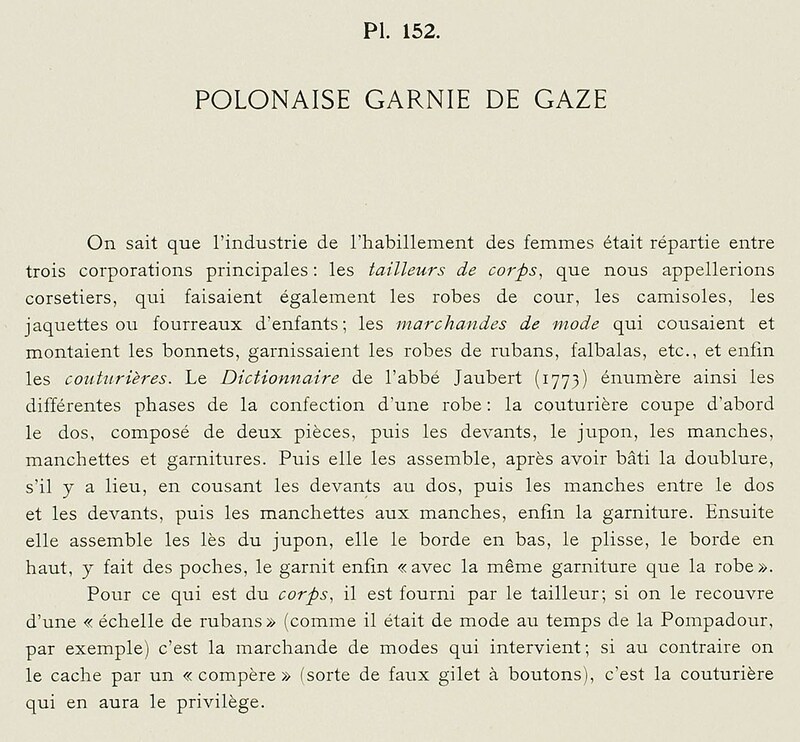 The Dictionary of the Abbé Jaubert (1773) thus enumerates these different phases of the making of a gown; the seamstress first cuts the back, composed of two pieces, then the fronts, the petticoat, the sleeves, manchettes, and trims. Then she assembles them, after having basted the lining, if appropriate, in sewing the fronts to the back, then the sleeves between the backs and fronts, then the manchettes to the sleeves, finally the trim. Finally she assembles the pieces of the petticoat, she edges them on the bottom, pleats them, edges them at the top, making the pockets, trimming it finally "with the same trim as the gown". 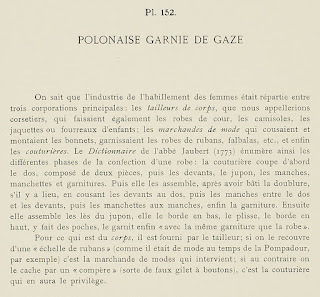 In terms of the stays, it is furnished to the tailor: if it is covered with a "ladder of ribbons" (as was fashionable in the time of the Pompadour, for example) it is the marchande de modes who intervenes; if to the contrary it is hidden by a "compère" (a type of false vest with buttons), it is the seamstress who will have the privilege.